Dian Xiao Er’s decor is meant to look like one of those old-school Chinese inns you see in movies -- you know, the sort where Shaolin Warriors stop at, mid-journey, on their quest for justice and peace. Timber furniture, carved wooden screens, red cloth aplenty, you half expect an epic fight to break out in Dian Xiao Er, with kungfu kicks and wine barrels flying around. 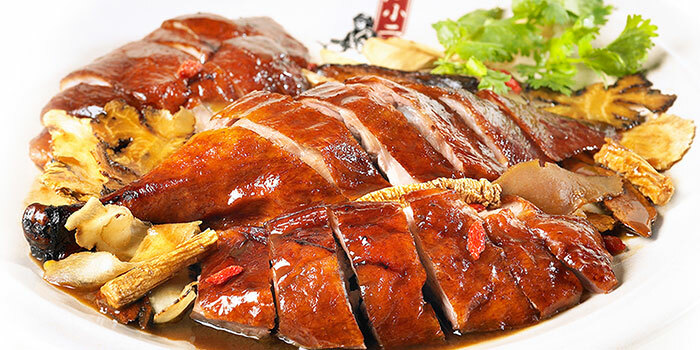 Except the only fight one can imagine here is over the famous Herbal Roasted Duck that has been the mainstay of the Dian Xiao Er menu for the last 12 years. The dark herbal gravy that the duck comes bathed in is made of 10 Chinese herbs that include codonopsis root, foxglove root, and licorice root. This gravy is said to have a calming effect while relieving mental stress and revitalizing energy. We were definitely very energized after eating this duck, not least because of its succulence and moistness. The duck skin itself is also crispy and adds a satisfying crunch to the dish. Paired with fragrant steamed rice, the flavours of this dish are strong, but not overpowering.